House those cats and dogs! Our dog and three cats have a variety of living quarters. Lilly Belle, our Great Pyrenees considers planet earth to be her province. 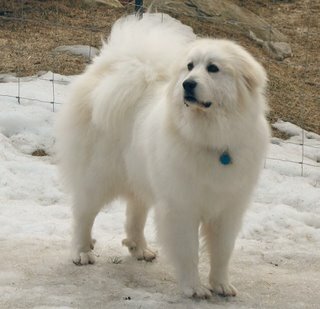 As any Great Pyrenees owner will tell you, a Pyr off the leash is a "Dis-a-Pyr" (say that fast). 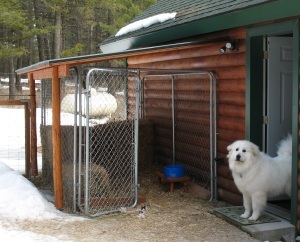 Consequently, if you don't live on a 5,000 acre ranch, Pyr's need to be fenced. Lilly's fenced play area is approximately one acre in size. Although she has her favorite perches, she will snooze anywhere. Lilly is not one to cuddle-up inside a dog house and stay out of the weather. On the contrary, she LOVES being out in the weather and nothing makes her happier than sleeping in the snow, regardless of the temperature. We have tried to make certain areas her 'den' and she has a wonderful 10-foot kennel lined with hay bales (below), but more often than not, she prefers to sleep out in the open where she can keep an eye on her flock... us. A dog house for Lilly Belle is not something that is high on the priority list as we don't think she will make use of it. It is hard enough to get her to stay inside our home longer than a couple hours. She is driven to patrol the perimeter of her fence and do the job she was breed to do - guard. However, we've done a good bit of research in this area of dog houses and if you are in the market, I'd recommend you check out DogHouses.com. They are the leading source for Wood Dog Houses, Plastic Dog Houses, and Crates and Kennels. From rustic looking log-style houses to barns and plastic designs of all types. 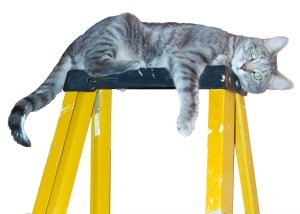 Puff: Pooh, what are you doing on that ladder? Pooh: I'm waiting for Thanksgiving. Pooh: I'm not really sure, but a bunch of 2-leggers show up, food is everywhere, I get petted for hours - and even Dad's in a good mood. Puff: Does Lilly know about this? Pooh: Lilly's a dog. She doesn't know about such things as Thanksgiving or even Indians and Pilgrims. Puff: What's Pilgrims and Indians? Pooh: Indians are like you and me, we were here first. We had the run of the whole house and we were happy. Then Lilly shows up and starts chasing us from place to place, eating our food and stealing our toys. Yeah, I think Lilly is a Pilgrim. Puff: Oh. I guess we're supposed to be thankful that we're not Pilgrims, is that it? Pooh: How would I know? Do you think I make this stuff up? Hi gang, Lilly Belle here (you know me, I'm the Great Pyrenees puppy). In our last posting we talked aout 'ol Dad being a crafty fellow, and I have to tell you the he really likes me. Dad likes to take me along with him when he goes to town. He drives a huge Dodge truck that mom says she needs a step ladder to get into. They didn't want me to jump up or down from the back seat, so Dad invented a "Lilly Pad". The back seats lift up and out of the way, so Dad built a platform that rests on the floor and he covered it with indoor/outdoor carpet. This is where I ride when we drive to town. What's more, he also built a step for me to use getting in and out of the truck. This truck step is also covered with carpet so I don't slip when I get excited. You can see my truck step here. See, if my Dad didn't love me do you think he'd make me all these cool things? Oh and BTW, that's me and Pooh watching people walk up the stairs. Walking the dog - in style! Lilly's 2-legged dad is a crafty kind of fellow. Nothing makes him happier than tinkering in his shop. The best part about old Dad's tinkering is that he creates the neatest things for me and the furry members of the family. Dad is religious about walking Lilly every day - weather permitting. He even walks her in the rain. The only weather condition that puts a halt to the daily walks is ICE. The problem is that Lilly needs her exercise whether there is ice on the road or not. This posed a problem and the need for Dad to spend time in the shop looking for a solution. We have a Yamaha ATV, and we have taken Lilly out to run while we ride the ATV and hold the leash. However, in bad weather both hands should be on the handlebars to work the brakes and accelerator. Not having three hands, Dad's answer was to attach Lilly's leash to the ATV. Now anybody could tie the leash to the bumper, or metal racks on the front and rear, but that wouldn't do for Dad. No, he had to devise a special mounting system that permitted quick attachment and disconnects. In addition to being a crafty kind of fellow, Dad's also a closet geek and he made a webpage that shows you all the steps in creating a mounting bracket for Lilly's retractable leash. See Lilly's ATV leash project here! Hello, and thanks for stopping by. I have great hopes for this blog. The critters I share my life with are more than just pets, they're part of my family. The pure joy that they provide me every day was the motivation behind this blog. Their antics, pictures and funny stories will force a smile and bring joy to your day. Please come by often - take a break and enjoy. 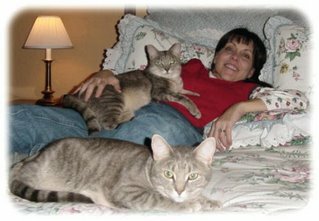 My furry family and I make our home in northwest Montana with my husband , daughter, three cats and our 100+ lb. Great Pyrenees "puppy", Lilly Belle. 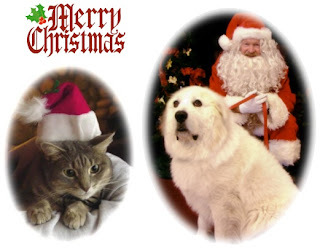 All of our critters have their own websites. Yes, that's me being kept warm by two sister kittens, Puff and Pooh. Puff and Pooh's site is written as a children's story and tells of their daily adventures in and around their home. 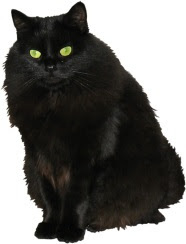 Our "mouser" is named Minnie and to learn of her exploits, you need to visit Miss Minnie's Cat House. She lives in the shop and has a very unique "cat house" with whole-house heating and a dining room! 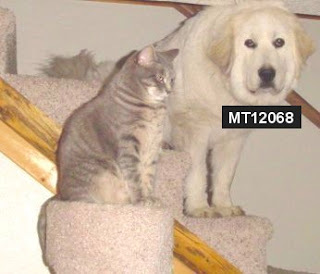 Our Pyr is named Lilly Belle and although she tips the scales at one hundred pounds, she's just a puppy.